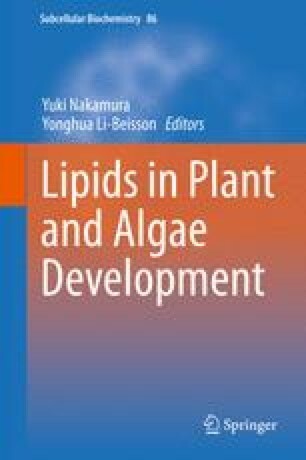 Sphingolipids, a once overlooked class of lipids in plants, are now recognized as abundant and essential components of plasma membrane and other endomembranes of plant cells. In addition to providing structural integrity to plant membranes, sphingolipids contribute to Golgi trafficking and protein organizational domains in the plasma membrane. Sphingolipid metabolites have also been linked to the regulation of cellular processes, including programmed cell death. Advances in mass spectrometry-based sphingolipid profiling and analyses of Arabidopsis mutants have enabled fundamental discoveries in sphingolipid structural diversity, metabolism, and function that are reviewed here. These discoveries are laying the groundwork for the tailoring of sphingolipid biosynthesis and catabolism for improved tolerance of plants to biotic and abiotic stresses. Research that contributed to this chapter was supported by the U.S. National Science Foundation (Grant MCB-1158500).